Spring is here and beautiful summer nights are just around the corner! 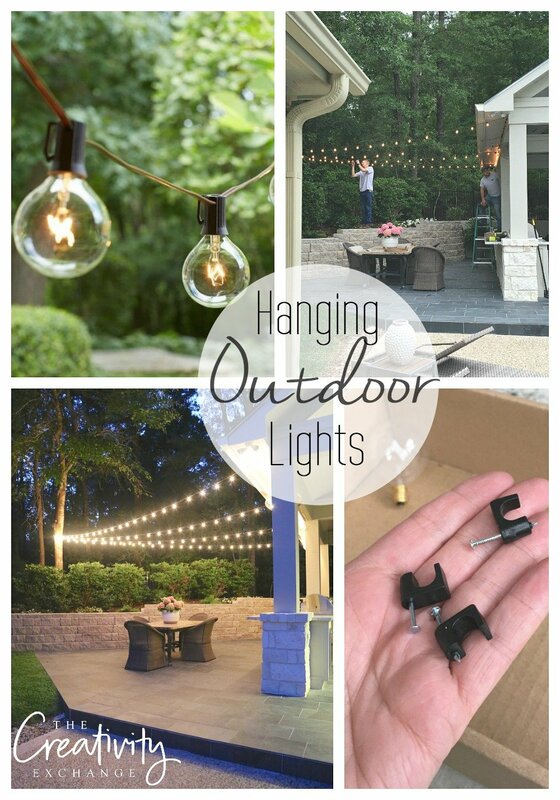 Today, I wanted to share some really easy quick tips and layout ideas for hanging outdoor string lights. 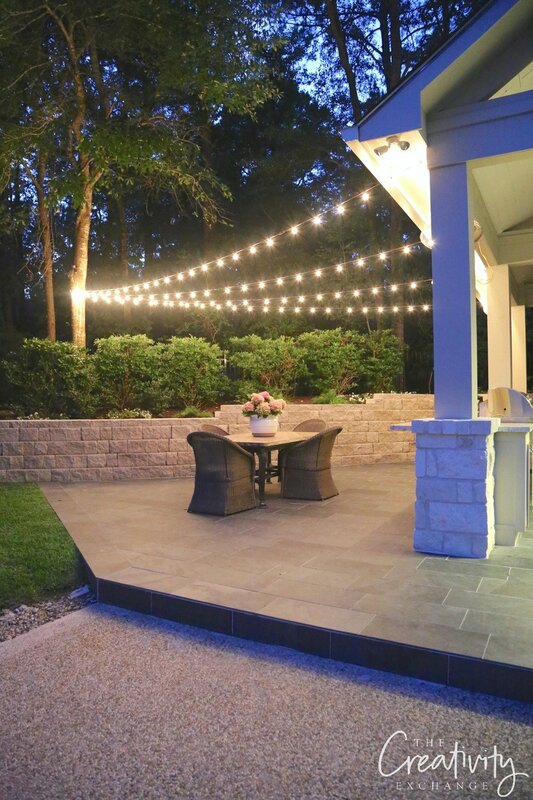 I’m also sharing my favorite sources for lights and things you’ll need to consider when purchasing outdoor string lights, bistro lights or cafe lights. Over the years, I have designed outdoor lighting layouts for outdoor events, client spaces and in my own outdoor space and it can be very challenging. I have learned so much over the years what works and what doesn’t work and you’ll find all of my tips below. When it comes to choosing the right outdoors, this is the most important thing to consider. 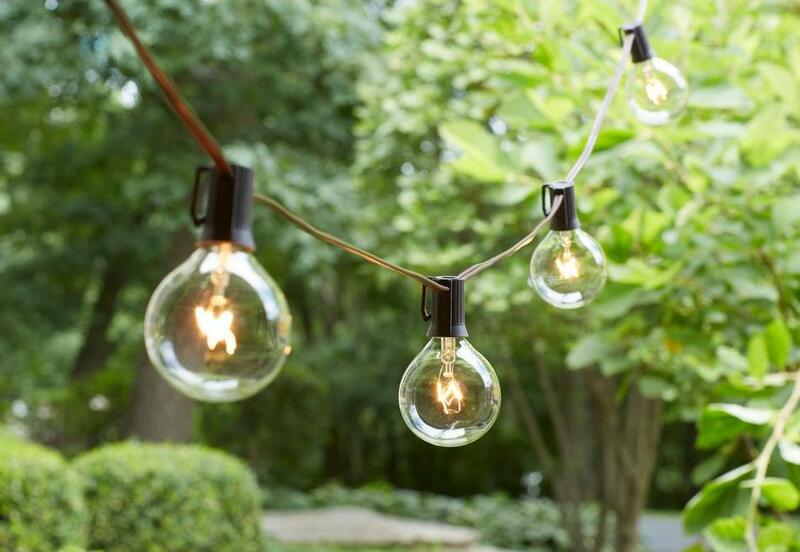 There are so many varieties of outdoor string lighting out there that it can be so confusing. 1) Choose a staple brand of lights that are in stock all year. I have tried pretty much all big brand lights out there but I now only buy my outdoor lights from Home Depot because they keep them in stock all year (year after year). If you buy off brand string lighting, you will run the risk of the lights not being available for replacement bulbs or if you want to add more strings over time. I also buy two extra boxes for replacement bulbs because at $9.98 a box, it’s cheaper for me to just buy more string lights than buy replacement bulbs. As you choose string lights, be sure and double check to see if the lights are glass or plastic. I personally prefer glass bulbs because there is such a big difference in the way the lights look. 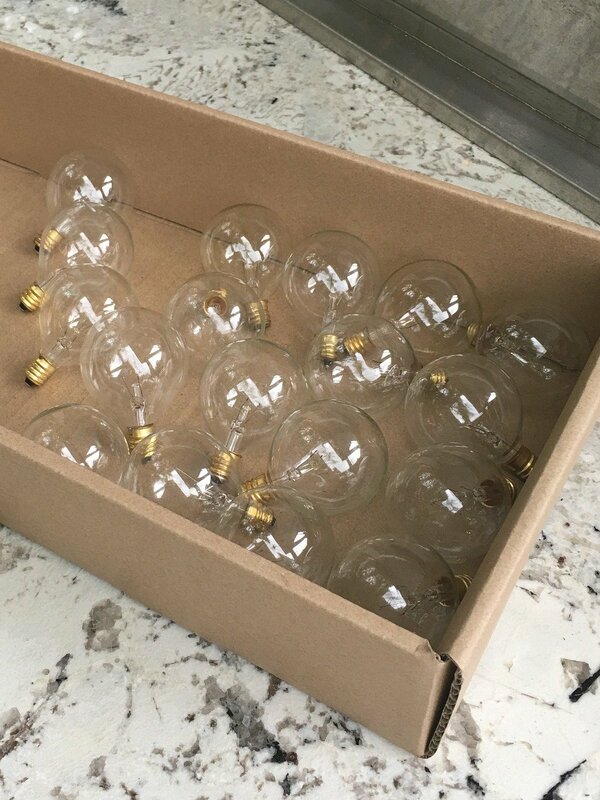 While it’s hard to tell when they are in the box, I do think that plastic bulbs can look like plastic when they are hung and turned on. It’s just a personal preference for me but glass just illuminates beautifully! 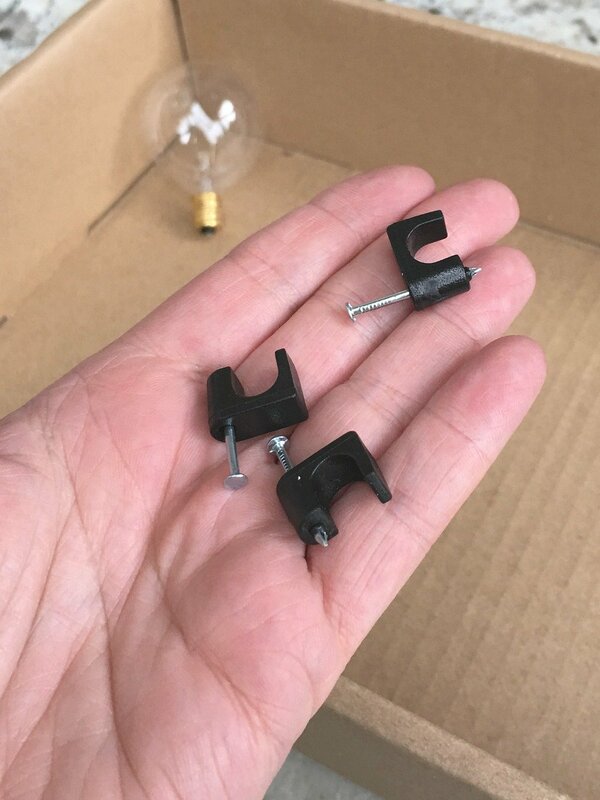 If you’re going to buy staple string lights from Home Depot, Target and Walmart that are available all year, they are most likely going to be round blubs that are called bistro lights or cafe lights. Again, this is personal preference but I just love the look of traditional bistro/cafe lights at night. I also think about what the space will look like in the daytime and I want the lights to sort of fade into the landscape and not stand out. The smaller bistro/cafe lights do that because the ones from Home Depot that I use are not terribly large and they are on a brown cord. The Home Depot lights that I use are really bright and beautiful at night and just the right size. In the day, I hardly notice them. 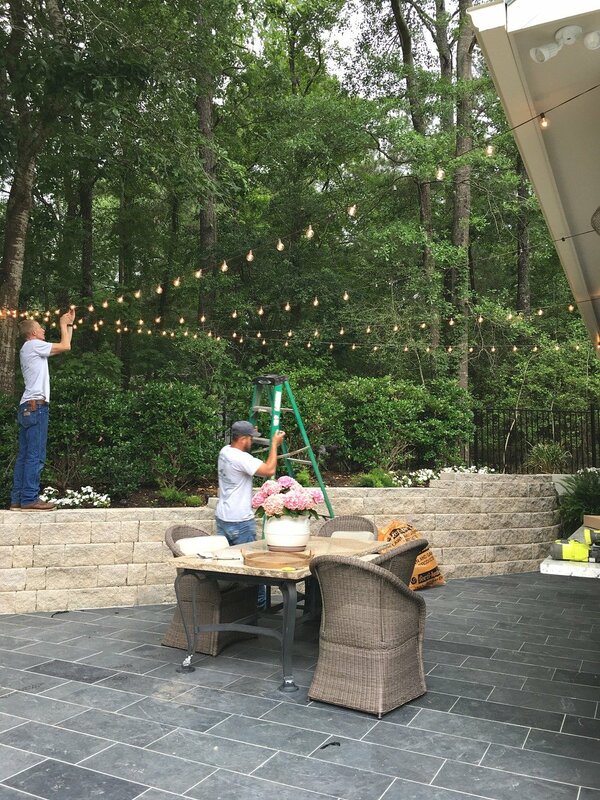 I have also learned the hard way over the years how to hang outdoor lights and what works best for securing them, tips for draping the lights and securing the connections. 1) Remove glass bulbs before hanging! If you are using glass bulbs, it’s much easier to remove all of the glass bulbs before starting to hang. If you’re just hanging one or two strands, you do not need to do this but if you are hanging multiple strings and criss-crossing, it is much easier to do this when you’re not having to be careful of breaking the bulbs as you connect, drape, etc..
Once you have all the strings hung and connectors secured, you just simply add the lights back in. Coaxial staples are the best things to use if you are securing lights to wood like the side of your home or trees. As you can see above, the cord is secured by the staple opening. 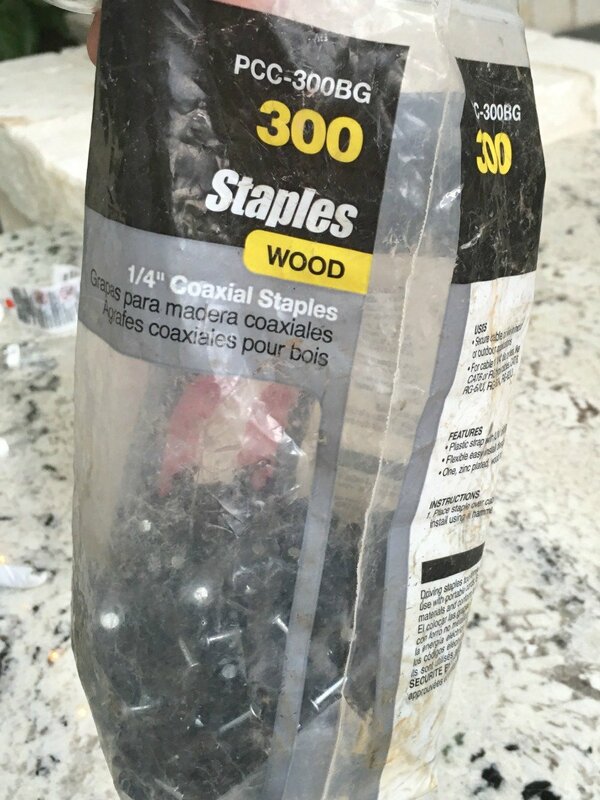 You can buy Coaxial staples (for wood) at Home Depot, Lowes, etc.. in various sizes. Just check the size of your string light cord to get the right size. Because of the way the string light drapes and the number of strings on one line, often times if you have more than two connected, the end connectors may not be as secure as it should be because of the weight. You will need to secure the connectors and we secure just by wrapping the connectors with electrical tape in the same color as the cord. I personally think outdoor lights look so much better when they are draped in the middle and sort of slack down some. The way to do this is make sure that your two hanging points (start and end) and exactly secured at the same level and give the string lights just a little slack. 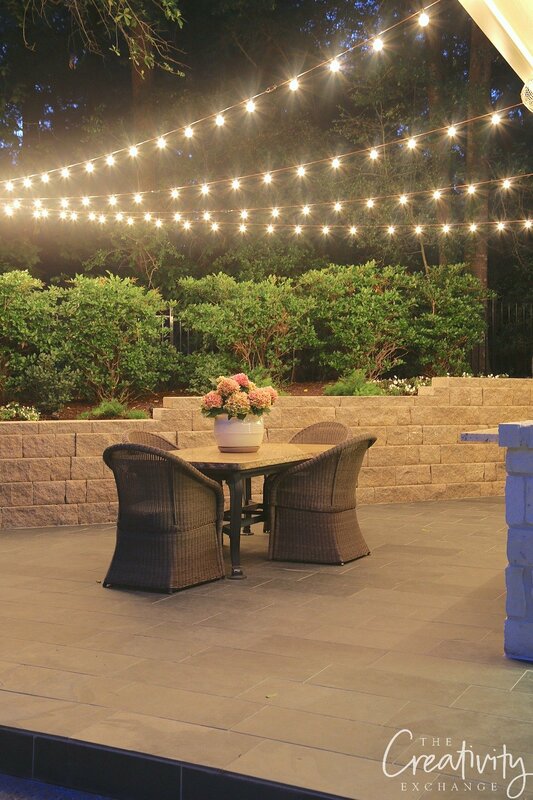 Choosing a layout design for hanging outdoor lights can be challenging. I always start by looking for trees and the side of homes as I start a layout plan to avoid having to install posts. Sometimes there is no other option but to have posts installed. It really helps to draw a quick sketch of your space on paper and make an “X” at trees and areas that you could secure the lights. You’ll also need to factor in power sources. The lights that I use from Home Depot allow for up to five strings to be connected, which is 60 ft. So 60 ft. is a lot of length to begin and wrap around a tree and come back and usually enough for me to one need one power source. Next you will need to decide if you want your string lights to criss-cross or not. If you have a square or rectangular space, criss-crossing looks so pretty and you can quickly draw out your plan on paper for starting and ending points and be sure an factor in slight draping/slack. If you have a non-square/rectangular outdoor space, it works best from a design standpoint to keep the light layout basic. For example, my outdoor side patio is a wedge layout and when I identified and highlighted areas where I could secure the lights on a quick sketch on paper, I immediately was able to envision my string light layout plan. If the layout isn’t immediately clear, sketch lines for lights in pencil and try different combinations. Here is basically what my sketch looked like. After you settle on a light layout plan, add the measurements between secure points to your sketch and then you will be able to determine how many string lights you’ll need. It’s that easy! I hope this helps as you set out to create a beautiful outdoor space! I’m always here if you have any questions. 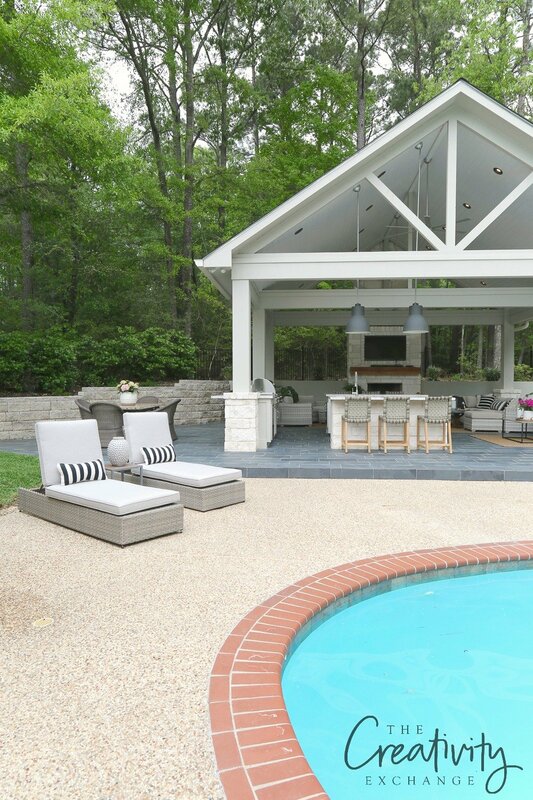 By the way, if you haven’t seen our newly finished outdoor space/pool house, you can see the rest of it here. Thank you for a wealth of detailed information. You’ve made this process so much easier. How do you store your bulbs so they don’t break? Thanks! Thank you. I have always wanted to spruce up my little summer porch with these. How do you keep squirrels from chewing through the cord? I have never had that issue at all. I keep lights up all year and have a yard full of squirrels but they have never bothered the cords. Suggestions for hanging lights on an L-shaped covered deck? Should I swag back and forth across the space or just out line the sides of the porch along the ceiling? Or just highlight seating areas? That was very helpful. Thank you. When will you be posting your detailed Outdoor Kitchen/Pool House makeover? We are considering doing a covered area by our pool and would be very interested in getting the cost break down and source list. Your area is just beautiful. We are getting ready to hang these up in our back patio and they make such a difference. Nice! We plan to do something similar at our house. Question: Did you do just one continuous strand (with multiple strands taped together). If so, where did you start and how to you drape it back and forth. 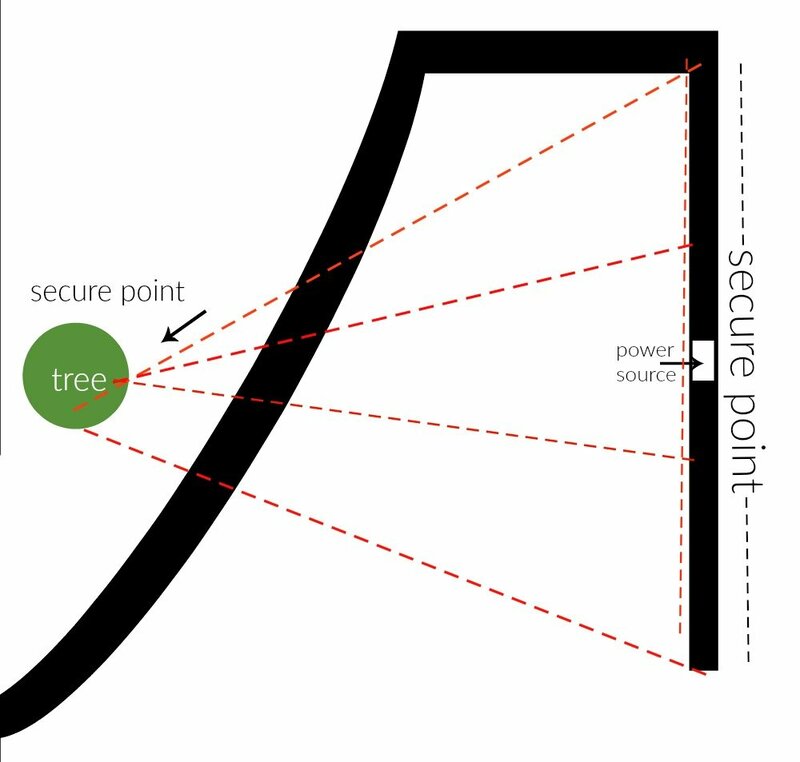 I’m trying to figure out where the starting point was, and the order, how you went back and forth from the secure point with the electrical, to the tree. If that makes sense. I want it in this exact configuration and I’m a little confused about the order of connecting between each secure point. Thanks in advance for your help! This is exactly what I want to do on my patio! Three or four strands coming to a point on my garage but I don’t have a tree or anything to attach them to at one point on the end of the potion. Wondering if you have any suggestions what would work and what would look good?? A metal pole or a wood pole/beam?? And did you find any certain brand of lights at Home Depot that are the Best Buy for all the lights you need? There’s so many to pick from! Thank you! I usually leave most “Tips for XYX” posts feeling like they weren’t much help at all, but this post was super helpful! 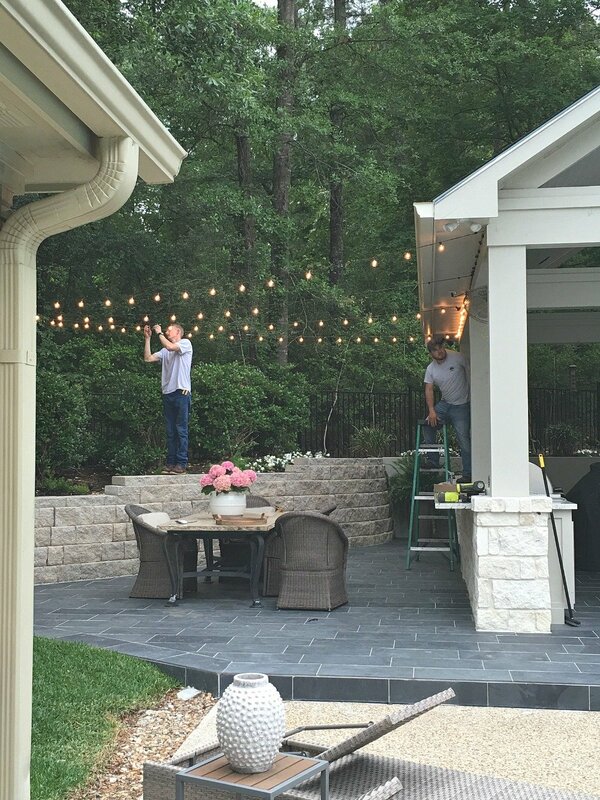 Thanks so much for sharing your expertise, I’m excited to buy & hang lights in our new yard. Well… make my husband hang them. But you know what I mean. 😉 Thanks again! We have a frontal courtyard home- basically the entry is in the center of a U with house on both sides. Do you think the hanging light is too messy to hang in the front area? It is actually our outdoor porch area of the home. The back is a screened in under truss patio. I have considered making it into a cafe-like living area but have been reluctant putting things into the front entry area might look tacky. I think you could absolutely do it at the front area without it looking tacky! I would just hang maybe 4-5 rows of them (with slack so they slightly drape) from one side of the house to the other and use the smaller cafe bulbs. I think as long as you do not criss-cross or use huge bulbs, I think it would be beautiful and not as obvious during the day. As night it would be stunning!! I hope that helps. How do you cross-cross the lights ? My space is a rectangle ! Thank you!! Your suggestions and ideas are very helpful. I have a square open cement patio with a fire pit on one side not quite in the middle, I have a tree I can run 3 strings with a wire & connect to 3 posts 12 feet ea. munis 1 foot under ground (11) the string closes to the fire pit is about 4 feet away…. my question is how high should go? & how far to stay from the fire pit? That’s a tough question Lydia! 4 feet away from the fire seems like a lot but if the wind changes directions and you’ve got a big fire, you could have an issue. I would for sure go about 10-12 feet up and I personally might stay away from the fire at a minimum of 6 feet. Maybe you could hang fishing line first with you light layout and have a really big fire before you hang lights and see if the line melts? I wish I had more info for you but I think you’re going to have to test just to be safe. Keep me posted on what you determine.